The sponge is one of the most commonly used tools in the kitchen. This is largely because sponges have such a wide variety of uses, ranging from cleaning up spilled milk to wiping away splotches on our stove top. But when not in use our sponge often sits on the sink, retaining water from its last cleaning and unintentionally becoming an incubator for bacteria. Rinsing a sponge under running water can clean off visible debris, but does not disinfect. But never fear, here are a couple of methods to clean your sponges and reduce germs. The Dishwasher: The same USDA study also showed that a sponge can be disinfected in the dishwasher. Simply put the sponge on the top rack and run a normal dishwashing cycle with heated drying. How often does a sponge need to be disinfected? To be safe, a good rule of thumb is to disinfect sponges as often as you cook. 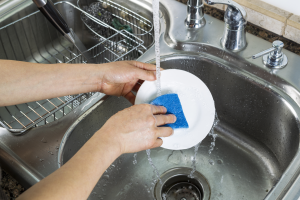 For daily maintenance, rinse off food particles and squeeze out all retained water before setting down your sponge. Bacteria love wet environments. Do you use a different way to clean your sponges? Or do you have your own cleaning or organization tip? Share it on the S.O.S Facebook page or tweet it with the #SOSWhoKnew hashtag. Don’t forget to follow us on Facebook, Twitter and Pinterest, too! I just run it through the washer and dryer every so often when I’m doing a load of towels or clothes. In addition to the above listed methods, I also put sponges and dishcloths in the dishwasher while washing a load of dishes. I didn’t realize this was already listed above. Microwaved sponges are HOT. It’s now a sponge full of nearly boiling water. Wait a minute or two before picking it up.